If water builds up in your sink, or your bathtub isn’t draining like it should, natural household remedies can often help. Utopia shows you how to unclog a drain without using chemical cleaning agents. Baking powder and vinegar: Put four tablespoons of baking powder into the drain. Then pour half a cup of vinegar in straight away. As the baking powder and the vinegar mix, you will hear bubbling sounds. Once the bubbling has stopped, pour hot water down the drain to rinse away the dirt. Baking soda and vinegar: Alternatively, you can use baking soda to clean the drain. As with the baking powder, put four tablespoons of baking soda into the drain, then pour in half a cup of vinegar. Rinse the drain with hot water after the bubbling has stopped. 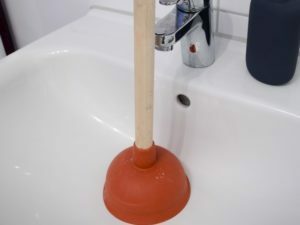 Position the plunger directly over your drain and press it down towards the sink. Seal off other openings – e.g. overflow protection holes- with a wet cloth. Run water water into the sink until the rubber dome of the plunger is completely covered. Move the plunger up and down without lifting it completely from the drain. After several cycles of moving it up and down, take the plunger out of the sink. If the clog has loosened, the water should be able to drain freely once again. Otherwise, put the plunger back on the drain and try plunging again. If it still does not unclog the drain, you might have to use another method to get rid of the dirt. Tip: If you don’t have a plunger on hand, you can cut off the bottom of a plastic bottle and use it in a similar fashion. If the plunger does not work to unclog your sink, you can try a drain snake. 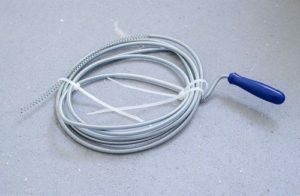 A drain snake is a special cable coil that uses a drilling movement to break through the grime in your pipes. We recommend that you only use this method if you are good with your hands. You have to be very careful to not damage the pipe. Gently insert the coil through the drain opening to avoid accidentally damaging the pipe. Slowly turn the handle to advance the snake while applying a slight pressure toward the pipe. Once you feel a firm resistance, pull the spiral back a little bit, then push it towards the drain again. If you cannot unclog the drain, please talk to a professional plumber. Some clogs are just too ingrained to be removed without professional tools.